Amazingly, a videogame publisher has listened to fans and actually toned down the DRM in its product. While PC gamers rejoiced when Capcom announced that it was finally bringing Super Street Fighter IV to the PC in the form of the updated Aracde Edition, they were considerably less happy about the game's incredibly restrictive DRM. Fortunately, Capcom has not only heard their complaints, but it has listened to them, and has outlined a plan to strip out some of the restrictions imposed by the DRM. Capcom's original plan for SSFIV: AE was that less than half of the game's roster - just 15 out of the potential 39 - would be available if the game wasn't hooked up to the internet. Fans were rather upset about this limitation, saying legitimate consumers would have a worse experience than the pirates. But posting on the Capcom Unity blog, Christian Svensson said that it was never Capcom's intention to make life more difficult for its fans, so would be removing the restriction through a small title update. According to Svensson, the update will likely come soon after launch, although he said that if it is ready at launch then Capcom will release it at the same time as the game. Once the update is applied, all 39 characters will be available regardless of whether an internet connection was present or not. While it would have been much better if the DRM had never been an issue at all, Capcom's response to the public outcry is a very positive one. While it's understandable that developers and publishers want to protect their investment, doing so by unintentionally punishing paying customers is not the best way to go about it. Hopefully more developers will be willing to listen to their fans about this issue in the future. 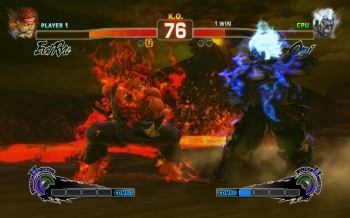 Super Street Fighter IV: Arcade Edition comes out on PC this July.